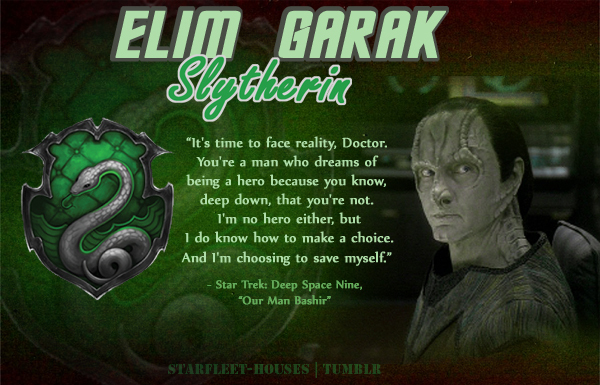 Garak - Slytherin. Elim Garak: Shrewd, cunning, secretive, mysterious and silver-tongued, Garak is a fine example of a Slytherin. He buries his true self under an intricate web of lies and is a very talented spy, as professed por his years in the Obsidian Order. Wallpaper and background images in the estrella Trek: Deep el espacio Nine club tagged: deep space nine star trek ds9 garak cardassians treek meets hogwarts slytherin. This estrella Trek: Deep el espacio Nine fan art contains animado, cómic, manga, historieta, anime, and dibujos animados.